Is the Uffington White Horse a natural feature? SCENE – Somewhere in southern England, one wet autumn day in the Bronze Age. Those who have the pleasure of spending too much of their lives travelling back and forth from the England’s west country to London would, if they cared to stop looking at their laptops for a moment between Swindon and Didcot, just be able to see the famed Uffington White Horse carved out on the long chalk hillside to the south of them. If they thought about it, they might have wondered why someone took the trouble to carve this horse out of the hillside in such an odd position. For the horse isn’t carved on the steep slope, where it would be easily seen. It’s carved instead at the change of slope between the relatively flat top of Whitehorse Hill and the steep sides of a dry valley known as The Manger. A casual perusal of Google Images will reveal that most good pictures of the horse are taken from the air. Uffington White Horse is renowned for its graceful curves, showing a flowing, abstract line suggestive of movement (apart, perhaps, from the head which could be from a duck for all I know). These curves are masterful, a series of arcs, almost all of which sweep round to enclose the space below the horse, indeed curving around the top of the slope of The Manger. 1st century BC coin of the Dobunni, southern England. Stylistically, the horse has often been compared with horses depicted on 1st century BC coins from southern England. Although there are clear similarities, there are also important differences. 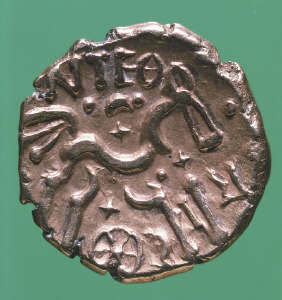 The coins have a rather charming horse motif made up of thick, bowed bodies, straight-line leg and tail segments and big, dotty knees. The peculiarities of these horses are largely due to the successive inabilities of several generations of coin engravers to copy the original Macedonian coins where the design first came from. However, in terms of “horseness” these engravers really understood horses. The same cannot be said for the carvers at Uffington. There is a vague sense of “horseness”, but you could just as easily argue its sense of “dogness” or “dragon-ness” or even “ferretness”. The white horse was first recorded back in the twelfth century. Nineteenth century observers noted that every fifteen years or so the local villagers would go up to re-cut the horse. If they hadn’t it would soon have become overgrown with weeds. For how long they must have been doing this only became apparent in 1994 when OSL (optically stimulated luminescence) dating was carried out on the horse. The dates, although a bit vague, suggested that the original but now buried surfaces of the white horse could first have been cut anywhere between 1400 and 600 BC. A very nearby circular earthwork, known as Uffington Castle, which sits on top of Whitehorse Hill, is reckoned to be near the younger end of this age range, perhaps suggesting that the two were linked in some way. Here I wish to put forward an idea which I keep thinking someone else must have had. 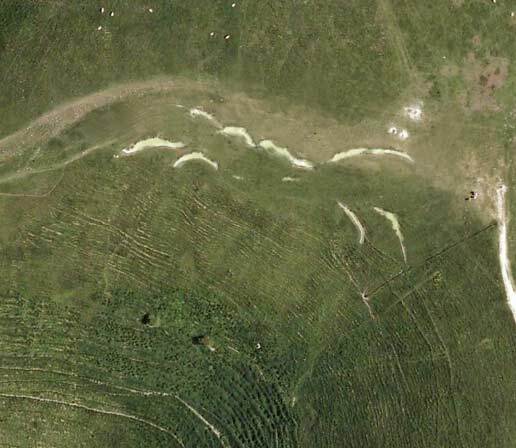 It’s this: what if the original Uffington White Horse is actually a natural feature? Let me explain. 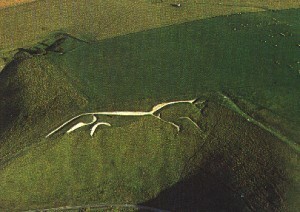 The Uffington white horse is carved into chalk, a notoriously permeable rock. So permeable is this rock that valleys carved into chalk (such as The Manger) don’t tend to have rivers in them because the water just soaks away into the ground. This was not always the case. The presence of the Manger and other similar valleys is due to the chalk ground being partly frozen around eighteen thousand years ago, decreasing its permeability. At these times rivers did flow, cutting valleys such as the Manger. We live in rather dry times, but between 1300 BC and 500 BC the weather in England became much wetter, reaching a peak around 700 BC. I hope those dates sound familiar. There is a process in geomorphology called slope failure. It is where the steep edges of landscapes tend to fall off when they become waterlogged. This happens to coastal cliffs and to any steep slopes. In England’s present dry conditions it tends to affect the least permeable rocks. However, in wetter conditions, such as those of the Bronze age (or, for that matter, a couple of years ago) this process can even affect chalk. I’m suggesting that the beautiful white curves at the top of the slope around the Manger at Uffington were originally formed during very wet conditions. This caused failure of the chalk rocks and soil around the edge of the valley, exposing dirty brown chalk at the top of the valley. I think that people at the time liked what they saw. They embellished it in two ways: first they carved a duck’s head onto the chalk “animal” which had now appeared; second, they packed the feature with clean white chalk. Now much will have changed over three thousand years. The rains got gentler and the surface of the land around the horse smoothed over. Endless re-cutting and repacking of the “horse” shape each generation has taken off the rough edges and altered bits until what is now there is almost entirely man-made. But just possibly what you’re seeing is remnant of the most sacred, loved and carefully tended landslip in all of England. Castleden, R 2000 Ancient British Hill Figures, PB, pp111. Cunliffe, B. 1991 Iron Age Communities in Britain: an account of England, Scotland and Wales, Routeledge, pp747. Miles, D et. al. 2003 Uffington White Horse and its Landscape: Instigations at White Horse Hill Uffington, 1989-95 and Tower Hill Ashbury, 1993-4, Oxford University School of Archaeology, pp331. Hi – Regarding the effect animals have on the downs, especially on the rolling coombs such as those which make up the west side of the manger and those at Kingston Coombs a mile or so to the west, the sheep tracks make parallel lines or paths around the slopes, none of which as far as I remember cause any land slips. The sheep tracks run horizontally every few yards up the slopes, dozens and dozens of them. Thank you for correcting the age of the deforestation, above, but that would seem to confirm that the horse, seen as a whole from the air could have been a welcoming sign to friendly gods or a warning to enemy spirits etc.. I think iot’s gfreat that we don’t really know, it means we can be as dotty as welike with our speculations!!! Just came across your ‘Armchair prehistory’ (of which I thoroughly approve) and this piece on the Uffington horse or whathaveyou. What strikes me about the carving is its location — right on the Ridgeway and not far from Wayland’s Smithy with its charming legend of shoeing horses. The Ridgeway was almost certainly one of the major drovers’ routes in England and I’m wondering if the speculative landslip might have been caused by animals, perhaps overnighting in The Manger? Thankyou for your supportive comment. Yes, the ridgeway was probably an important drove, and perhaps general, route at the time, due to the soggy, wooded conditions of the valley. The ridgeway’s very likely to be older than this in it’s origins (current evidence suggests Bronze age I think, but I’d guess that a general ridge route here is Neolithic). If, as you’re possibly suggesting, the tree and thicker vegetation cover was cleared by animals, then that would certainly make things worse, exposing the ground to surface run-off. But, I actually don’t know the effects of animals on encouraging land slips in general and this could be significant. What I’m asking for here is certainly a bit abnormal on the chalk. Thanks for asking. Sorry to have taken a while to get back to you. That’d be no problem. As a matter of interest, what are the ritual connections that you’re looking at? One problem is that the downs were covered with forests until the Neolithic farmers got going with their chain saws so the land slip would hardly be visible and certainly not the whole picture as illustrated by you. Tree cover would have made distant viewing rather difficult. Interesting though – another avenue to explore. Thanks for the comment. Yes, it’s possible that there was more tree cover. However, Neolithic farming practices had removed most of the tree cover from the chalk even as far back as the third or fourth millennium BC. By the Bronze Age of the second millennium BC (the earliest that the white horse was likely to have been carved) there may well have been some forest cover in the lowland plains of the Thames valley but not near the White Horse. Bronze age farming was extensive by this time and had opened out the landscape of southern England considerably so the horse would have been quite visible from a distance across the countryside. All of the hillforts built at the same time were undoubtedly visible to each other too, for that matter. Regardless of the method of formation of the White Horse I shall follow your logic to a conclusion. If, as you suggest, no-one could see the horse from the ground when it was carved then was not intended to be seen from the ground. Perhaps it was for the gods then. So why carve it on a slope at all? Why not carve it on the hill top or in a flat field? The Uffington “horse” is actually a *cat*. Look at it…long body, short legs, a thin tail as long as the body, a short face with small, pointed ears and WHISKERS. Its a cat. The ‘Uffington White Cat’. Why not? A bit of a long neck for a cat but that’s true of my ferret suggestion I suppose. Certainly that’s not a very ‘horse’ face. Do you mean a wildcat, perhaps? Next post: The Avebury Sanctuary – a Neolithic bodge?